Fiat Chrysler has promised to upgrade the Brampton assembly plant's paint shop in 2017. To President Donald Trump, America’s $500 billion trade deficit is a symbol of economic weakness. If he wants a revamped North American Free Trade Agreement to shrink that number, he’ll need a seismic shift in how cars are made on the continent. With negotiations expected to start in August, makers of everything from toys to microchips are making their case for how the Trump administration should reshape the 23-year-old trade accord with Mexico and Canada. Based on the president’s zeal for reducing the deficit, the auto industry could hold the key to U.S. success in the talks. Trump has threatened to walk away from NAFTA if he can’t get better terms. The United States had a $63-billion trade deficit with Mexico last year, compared with a surplus of $7.7 billion with Canada. The automotive trade deficit with Mexico was $74 billion. In other words, if you took out trade in cars and car parts over America’s southern border, the United States would actually be running a trade surplus with Mexico. Most of the world’s biggest automakers have set up assembly plants in Mexico, taking advantage of wages that are significantly cheaper than in the United States. Traditional U.S. automakers still do much of their advanced design work and research and development in the Detroit area. By taking advantage of the comparative advantages of each country, automakers have behaved much as trade textbooks would have predicted when NAFTA was born in 1994. Yet the off-shoring of assembly work has contributed to the steady decline in manufacturing jobs in America, a trend to which some Rust Belt communities are still struggling to adapt. During the election, Trump’s promise to take a hard line on trade appealed to people who feel they’ve been left behind by globalization. NAFTA helped create an integrated supply chain that sees many auto parts cross the U.S. border at least eight times before a vehicle is assembled, the Alliance of Automobile Manufacturers said in a letter this month to Trump’s top trade negotiator, Robert Lighthizer. “Disrupting this integrated supply chain would increase prices, lower sales, threaten exports and endanger American workers’ jobs,” the alliance said, adding that automakers could seek supplies outside North America if the continental business model unravels. The group represents companies that sell cars and trucks in the United States., including Toyota Motor Corp. and Volkswagen AG. 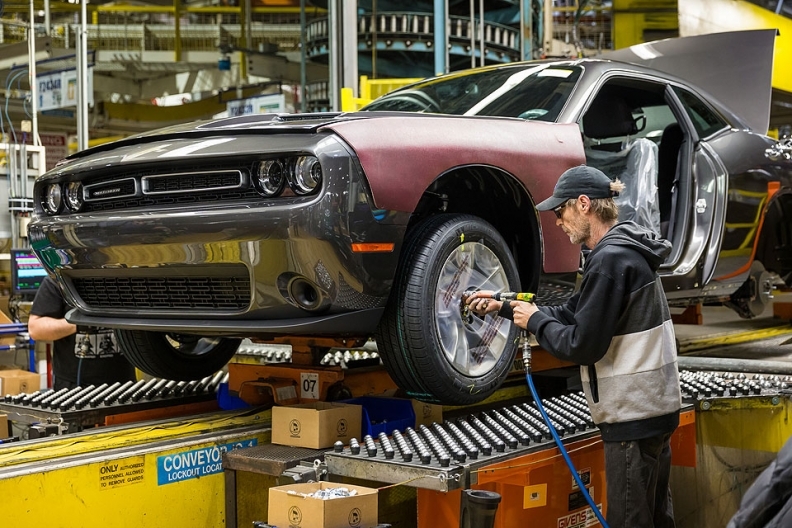 A study released in March by the Canadian Automotive Parts Manufacturers’ Association found Canadian parts makers employ about 86,000 people at 270 facilities in the United States and Mexico. At home, suppliers employ 71,000, the report said without providing a facility count. Sixty-four Canadian companies have 120 facilities that employ 43,500 people in Mexico alone. Trump has been urging automakers to produce more cars in the United States. Even before taking office, he threatened to impose a “big border tax” on General Motors Co. for building the Chevrolet Cruze south of the border. Other U.S. government officials then said vehicles produced in Canada could be subject to a similar tariff. U.S. officials have floated a range of NAFTA reforms that would affect car makers, such as tightening the so-called rules of origin that dictate how much of a product must be created in North America. Many economists argue trade deficits have more to do with the difference between savings and investment within a nation than the treaties it negotiates. By that logic, if the United States. keeps investing more than it saves, it will keep posting trade deficits. Even if America’s trade deficit with Mexico disappears, it may simply migrate somewhere else. Convincing automakers to re-shore production in the United States could give a short-term boost to the economy, helping Trump fulfill his promise to lift growth to three per cent annually and create employment. Since the financial crisis, manufacturing jobs in the auto sector have been climbing steadily as companies have ramped up output -- though the employment level remains far below previous decades. But longer term, it’s no guarantee that re-shoring would be a jobs bonanza. Automakers are increasingly using robots to automate assembly-line tasks, a trend that could eventually decouple the link between production and jobs. There’s already evidence automakers and their suppliers may not even need NAFTA. Under the agreement’s rules of origin, cars must have North American content worth 62.5 per cent of the vehicle’s value. But companies can ignore that rule if they pay the basic 2.5 per cent tariff the U.S. levies on car imports from countries that are members of the World Trade Organization. Currently, about five per cent of cars and parts imported from Mexico enter the United States in that manner. Commerce Secretary Wilbur Ross has expressed optimism the United States could reach a new deal with Canada and Mexico by early next year. Lighthizer was less bullish last week on that timeline, stressing that the administration won’t hold itself to any deadline. The United States is holding public hearings this week to inform its negotiating objectives. Even if NAFTA talks falter, the administration may seek to negotiate a single-industry deal that limits the amount of cars and parts imported from Mexico, said Freund. In the early 1980s, then-president Ronald Reagan convinced Japan to sign a “voluntary export agreement” under which it cut the number of cars it sold to the United States, setting off a string of similar deals on everything from steel to shoes.